Who's afraid of a ghost? Not your kid! He's the type of kid who's ready to capture every ghoul, ghost and goblin that goes bump in the night, which is why your child might be the perfect new recruit for the Ghostbusters. Your child just needs courage of steel, a few Bill Murray-esque one liners and maybe a sweet outfit for him to take his first steps into becoming the newest member. Based on the classic 1985 movie, this Ghostbusters costume comes with a tan work jumpsuit bearing the ghost symbol. The jumpsuit zips in front for easy on and off. 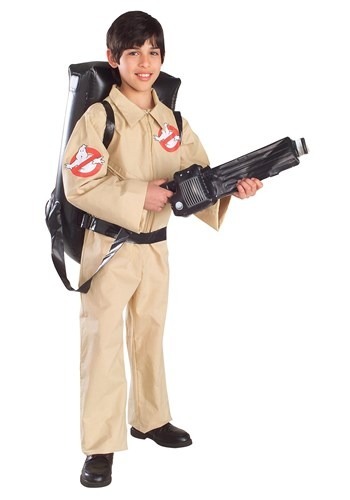 Of course, no kid can dare pretend to blast ghosts unless he has a Proton Pack! We thought it might be a little to dangerous to start your child out with the real thing, so instead, this costume comes with an inflatable version of the high tech ghost hunting gear. That way he won't destroy the plane of existence by accidentally crossing streams!